Commercial and industrial overhead doors range from weighing a few hundred pounds to over a thousand pounds. Vertical-lift and high-lift door systems are frequently used in commercial and industrial settings to maximize space. Read below measure your old spring(s) and find your new torsion springs to purchase. » Replace All of Your Torsion Springs? Commercial high-lift doors open vertically before rolling backward. Commercial and industrial torsion springs are used in warehouses, loading docks, and a variety of other locations that require large overhead doors. Because of the wide range of applications, door sizes and therefore door weights, the torsion springs on commercial and industrial doors vary greatly in size and lift. Vertical-lift doors open straight up. Depending on the application, commercial and industrial doors come in a variety of lifts, including high-lift and vertical-lift. High-lift doors are a common way to utilize space as they raise the door closer the ceiling before rolling back on the horizontal tracks. These doors have a special drum that take several turns of cable to increase the moment arm as the door opens vertically. 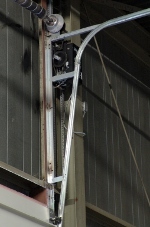 When the door rolls back on the horizontal track, the cable reaches the flat portion of the drum and mechanically behaves as a standard lift door. Vertical-lift doors, on the other hand, open straight up and do not roll back. These doors are especially useful in maximizing space in taller buildings, especially warehouses where forklifts move large quantities of products. Top: A split shaft with a coupler requires two spring anchor brackets. Bottom: Other doors use two brackets without a split shaft. Commercial and industrial torsion springs mount to spring anchor brackets. 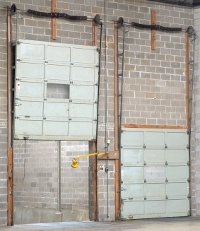 While some doors only require a single spring anchor bracket like the vertical-lift door pictured above, others utilize multiple spring anchor brackets. Multiple brackets are almost always required when multiple springs are used on a split shaft as both springs typically do not fit on one half of the shaft. Wider doors often use multiple springs in a linear system, thereby requiring the outside springs to use additional spring anchor brackets. Single, duplex and triplex springs are all utilized in commercial and industrial environments. By fitting a spring with a smaller inside diameter inside of a spring with a larger inside diameter, the springs work in conjunction with each other and require less space on the shaft. 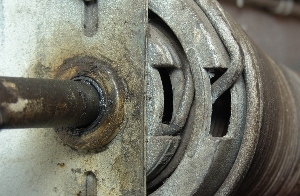 One disadvantage of the duplex and triplex systems is that broken inside springs (as pictured at the top of this page) are often undetectable without weighing the door. Furthermore, measuring the dimensions of an inside spring is more difficult as it requires unwinding the outside spring and removing the cone before any measurements can be made. 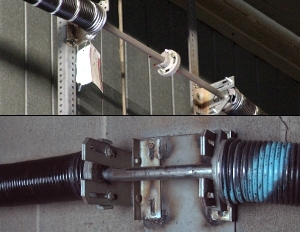 Regardless of your spring dimensions, lift system, shaft style, spring system, or number of springs, you can order replacement torsion springs for your commercial or industrial overhead door. After measuring your old torsion springs, determining which springs you need to replace, and considering longer life spring options, you can place your order for commercial torsion springs. There are five characteristics of torsion springs: 1. Inside Diameter (ID), 2. wire size, 3. length, 4. wind, and 5. end types. For each torsion spring you plan on replacing, you will need to obtain each measurement. Each measurement must be made carefully for your to receive the proper replacement springs. See our How to Measure Torsion Springs page for more information on obtaining these dimensions. To measure springs on the inside of duplex or triplex systems, you will have to first unwind the spring system and remove the cones to access the internal spring. Replace All of Your Torsion Springs? Torsion springs are rated for a specific number of cycles based on the number of turns that are applied. Since springs on a door are typically rated with a similar cycle life, we typically suggest that you replace all of the springs on your door together. Because of the relatively high cost of replacing the springs and the subsequent loss of possible cycles from the old springs, many customers decide to only replace one spring at a time. Ultimately, the decision is up to you - you can replace all of your springs at once and save time on the labor, or you can replace all of the springs on your door at once. This high-lift cable drum says APCO 5750-120. 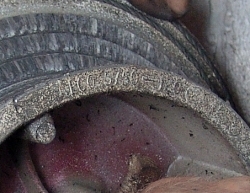 Many cable drums are covered in paint, dirt, or other substances which make it difficult to read the label. Please contact us if you are interested in purchasing springs with a longer cycle life. We will need your current spring dimensions, cable drum number, door dimensions, and possibly other measurements in order to provide you with possible cycle life upgrades. Torsion spring upgrades are based on matching the torque rating per turn (IPPT) of your current spring to a new spring or by finding the necessary IPPT based on your door and cable drum. Increasing the cycle life is accomplished by increasing the wire size. In order to maintain the same lift as with your old torsion spring, your new spring will require a greater length of steel. This increase is accomplished by either increasing the length of your spring or by increasing its inside diameter. The space on the spring shaft often becomes a limiter for torsion spring upgrades. A longer cycle life spring often requires more space on the shaft and therefore may not be an option based on your current system. If you do not have a duplex or triplex system, upgrading to such a spring design may give you the space you need. If you wish to upgrade the cycle life of a duplex or triplex system, you will need to replace the internal and external springs simultaneously. If you do not, you may not be able to reassemble your spring system with your upgraded spring. In recent months, there has been a rising concern about the type of steel used in springs. For example, Chinese imported steel and springs are often more brittle and can therefore be of a lower quality than other sources. At DDM Garage Doors, Inc., we make it our primary concern to not only help people figure out how to repair their doors, but also to provide excellent products for our customers. Therefore, if you purchase a spring from us, you can rest assured that all our springs are made with high-quality steel from the United States. WARNING! Replacing torsion springs is dangerous work, even for experienced tradesmen! Springs are normally under extreme tension. Damage to property and loss of fingers, limbs and life can occur without following proper procedures or without using the right tools. DDM Garage Doors, Inc. wants your business, but not at the expense of your safety. If you have any doubts about your ability to perform the work safely, we recommend you hire a professional to do the work. Before ordering your springs, be sure you have measured them correctly as most commercial and industrial torsion springs are not returnable. NOTE: Most customers order springs with cones already installed, but many order springs without cones installed because some of the OEM cones cost more than the springs. If it appears more economical to order the springs without cones installed, we advise that you consider the following. Many cones are screwed into the ends of the spring and they are secured to the spring by friction. Removing these cones can be difficult. Please review our instructions on How To Remove and Install Torsion Spring Cones before purchasing springs without cones. These instructions are made for the smaller 1 3/4" ID and 2" ID springs, but they apply to most springs with 2 1/4," 2 5/8," 3 1/2;" 4 1/2" and 5 1/2" inside diameters where the cones screw into the ends of the springs. On many commercial and industrial spring systems the spring wire is bent on the ends to secure the cones to the springs. These cones tend to be easier to replace than the screw-on type that uses friction to secure the spring to the cones. For example, on their 1 19/32" and 2 25/32" ID springs Crawford extended the ends to lock into the outer portion of the cones. BarCol bent the ends of their 1 13/16" ID springs to hook on the raised portion of the end cones. On their 2" ID and many of their 3 3/8" ID cones Overhead Door bent the ends up 90 degrees to fit into retaining clips. Be sure you select the correct ends if you order the springs without cones installed. Special notes about Overhead Door Cones. Because of inconsistent hole sizes for winding bars Overhead Door winding cones are dangerous and we recommend replacing them with the newer stile screw-on cones. However, if you do decide to order these springs without cones, you'll need to select "Overhead Ends" if you are ordering on line. If you email or call in the order let us know you have Overhead Door cones so we can bend up the ends of the spring wire to fit in the clips. If you are ordering 2" ID springs with cones to replace the older 2" springs with retaining clips, let us know in the comment section of the order. The one inch bolts are not long enough to secure the new stationary cones to the spring anchor bracket. We will provide longer bolts and wider flange nuts at no charge to help with your project. Apart from the Overhead Door brand cones most of the remaining commercial and industrial springs screw onto the cones and the ends of the spring wire are heated and bent to fit into a slot in the cones. These include most of the cones for the 3 3/8," 3 3/4," 5 1,4;" 5 7/8," 6," and 7 5/8" inside diameter springs. When Replacing Commercial Overhead Door Torsion Springs with these inside diameters you will normally need a torch if you order the springs without cones installed. You can order the springs with standard ends and heat the ends to bend them into the cones, or you can order the springs with the "ends in" and heat the wire several inches from the ends to bend the wire up to ease screwing in the cones. After that you would reheat the wire to bend the wire into the cone. If you have reasons to change the inside diameter of a spring or springs, visit our Torsion Spring Inside Diameter Converter page. Prices listed are for torsion spring orders under 250 pounds. For orders that weigh between 250 and 500 pounds, deduct 5%. For orders that weigh between 500 and 750 pounds, deduct 10%. For orders that weigh between 750 and 1,000 pounds, deduct 15%. For orders that weigh between 1,000 and 2,000 pounds, deduct 20%. For orders that weigh between 2,000 and 3,000 pounds, deduct 25%. If you are looking for torsion spring hardware, see our torsion spring hardware prices. Enter your spring information in the form below and click "Go!" Winding cones normally come with one inch holes for one inch shafts. If you need cones for 1 1/4" shafts, please note this in the comment section of your order. Once you have added your springs to your shopping cart, proceed through the checkout to place your order. Note: Most commercial torsion springs are not returnable. Be sure to measure your springs properly before ordering! Ends up for Overhead Door brand doors using 2" ID springs. For use with Wagner brand doors with 2-1/2" ID springs. Ends In for some McKee brand doors and some doors with 2", 2-5/8", 4-1/2" and 6" ID springs. Crawford T ends for Crawford brand doors using 3-25/32" ID springs. Crawford: Long Ends for Crawford brand doors using 1-19/32" and 2-25/32" ID springs. Barcol ends for Barcol brand doors using 1-13/16" ID springs. When pushing the ends of a spring toward each other, a gapped spring allows the spring to compress. A spring that is not gapped does not compress. How to Test for Gapped Springs: To check if your current spring is gapped, see if a piece of paper will slide down between two coils. If there is enough space for the paper to slide between coils without manually separating the coils, your spring is gapped. If your are wrinkling the paper to make it fit, your spring is not gapped. Are gapped springs better? No, they are neither better nor worse. Some torsion spring systems require that the springs be gapped in order to provide adequate space for the spring to grow as it winds up.